Another day in paradise at Seabright Lawn and Tennis Club on a spectacular fall morning. As a tournament progresses the parking lot gets less crowded as players who have been eliminated leave for homes around the country. There is something very different about the last couple of days of an event. Early in the week everyone is reconnecting, talking about family events, injuries, past matches and future plans. But when the quarter and semifinals arrives, players start to spend more time in their own focused boxes. We say hi but also know that we will be competing with each other and everyone has personal strategies for these times. I am still friendly but I am not doing much connecting. I stay pretty separate, hanging only with Jo Ann and my doubles partner, Charlie. Eight players left in the singles this morning and only four left this afternoon. Four doubles teams in the afternoon and only two remain tonight. I played the #5 seed in my singles match. A tough opponent who hits with excessive spin on the serve, forehands and backhands. This is particularly challenging on the grass where the bounce is very low even without the spins. I had visualized his shots before going to sleep last night and, again, this morning while I was doing my daily meditation. I pictured myself getting lower than usual on service returns groundstrokes and passing shots. It paid off as I jumped all over him with a 6-1 first set. The second set was more of the same until I was serving at 4-1 when he started getting a feel for my serve location. I was sticking with what had been working and was worried about switching to something different. It cost me as I had too fight off three game points. I was fortunate to escape that game and knew that I would need to adjust. I learned from yesterday’s match that I needed to be courageous about making changes from my favorite shot locations. He must have sensed my slight drop in focus as he started to play more confidently, holding his serve. With the score 5-2 mine, sitting on the changeover I was aware that the match has just gotten closer than the score indicated. Tennis is like that. The score does not reflect who has the momentum. He was grabbing it and if he broke my serve I would have been in a battle to get to the finish line. I was serving for the match and a spot in the semis from the side that gave me trouble yesterday and still was today. This time, though, I adjusted my toss and grabbed the lead 40-0, triple match point. But he was not done yet as he took advantage of me “future tripping,” thinking the match was over. He fought back to deuce. I took a long walk, focused on my breath, which drew me into the present. I was now free of thoughts, the static that interferes with performance and I serve it out for a 6-2 second set. Victory. On to the semifinals. In the semifinals of the doubles, Charlie and I played against this same player and his partner. They would be formidable opponents. At lunch we discussed coming out quickly and giving them a message. We knew to focus on making no errors on service return to put pressure on their first volleys. The early message was important because they were very focused on us rather than themselves and what they needed to do. We broke it open right away, winning the first twelve points, grabbing a 3-0 lead and sprinting to a 6-1 first set. The second set was more competitive as they started to believe in themselves. We didn’t drop our level but their focus came up. We were serving at 4-2, seemingly in control when they played aggressively and got to game point a couple of times. Charlie and I kept communicating well, supporting each other, planning strategy and we managed to get the game and then broke their serve to win the match. Again, the score was not a reflection of how close the second set was. A few points here and there and we could have dropped the set. We were really pleased how we dealt with their strong second set challenge. Into the finals. We will be playing against two top doubles players, one of whom I have partnered with in Senior Davis Cup. He is a three time World Champion in doubles. There are about 125 National Championships amongst the four of us. It should be a battle. I am still feeling so relaxed with each day feeling like a nice day of tennis on the grass. 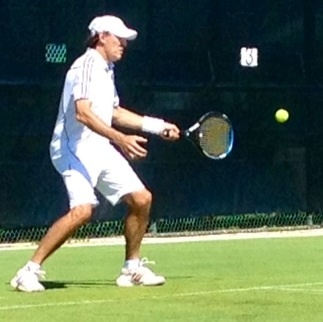 I continue to love the grass court experience and love definitely makes it easier to play to my level. I can remember how I felt 25 years ago when I was playing into the semis of a National for the first time. Scared. Worried. Inexperienced. Non knowing which Bob would show up. Now I know that I will just be Bob and that will just have to be enough. When I am myself I play to the high end of my skill and talent and I can live with whatever the outcome is. 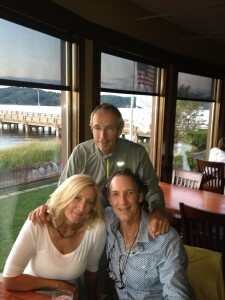 Jo Ann, Charlie and me after winning the semis. Stay focused and positive and bring home more medals. You have had a great summer! Please say hello to Charlie from Roger Ratner. 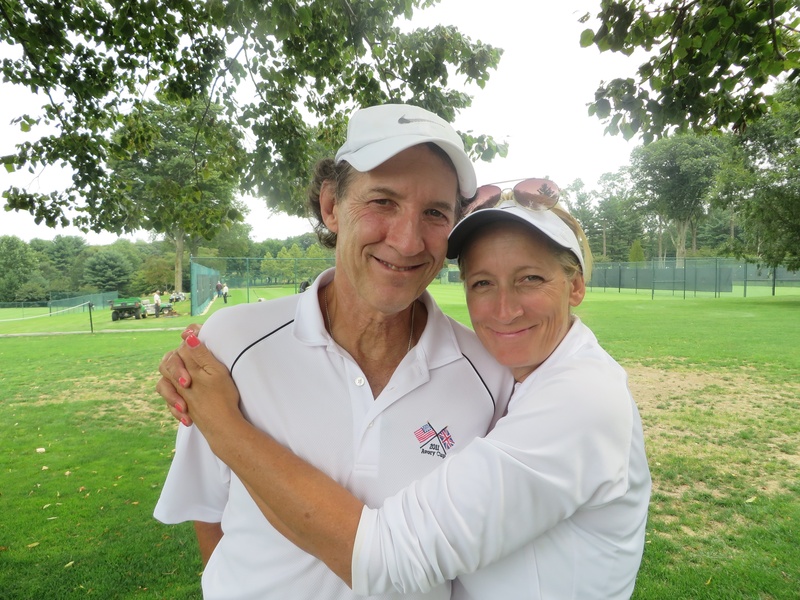 An old friend of his, I’m told…..
Look forward to mixed doubles. Thank you for your inspirational posts and good luck!